Starting May 1, the platform-specific content in Metal Gear Solid V: Ground Zeroes will become platform agnostic, publisher Konami announced today. Up until now, PlayStation and Xbox players both got slightly different Ground Zeroes experiences, since both versions of the game came with a unique mission. 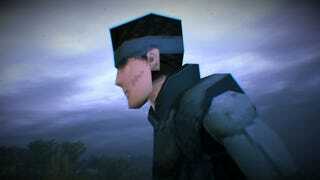 PlayStation 3 and 4 players were the only ones who had a special mission called "MGS1 Déjà-Vu," which let them play as a polygonally retro version (seen above) of longtime series protagonist Solid Snake looking like he did in the original 1998 Metal Gear Solid. Xbox 360 and Xbox One players, meanwhile, were the only ones with access to another mission called "Jamais-Vu," which let them play as Raiden, the divisive star of Metal Gear Solid 2 and Metal Gear Rising: Revengeance. Konami said that the new release is intended as a token of generosity to commemorate shipping one million copies of Ground Zeroes. Sounds to me like the team is trying to thank loyal fans for supporting the game despite their frustrations with how short the thing is.